The smartphone requires operating systems iOS 11.0 or Android 5.1 and higher and must support Bluetooth® 4.0 LE (low energy) technology. 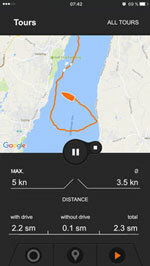 Use the map section to view your boat's GPS position, course and speed. A circle on the map shows the remaining range – it's that easy. You can store your favourite locations in a list. 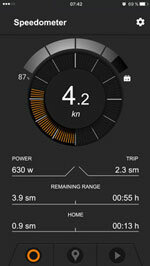 All information is displayed in real time based on current conditions and remaining battery capacity. 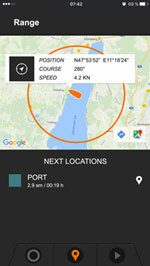 TorqTrac uses Google Maps. You can save your current tour: maximum speed, average speed, total distance, distance with/without motor, total journey time... Save your tours and store them in a list. TorqTrac was developed for use with Torqeedo electric boat motors (Travel 503/1003/1103, Cruise R / T, Ultralight) and only works with the TorqTrac Bluetooth® module that is available in our online shop or from your Torqeedo dealer.